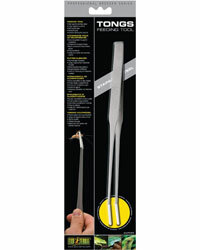 These great quality feeding tongs from Exo Terra make feeding your reptiles safe and easy and helps prevent injury to both owner and reptile. A firm action and coated tips means live insects and frozen foods such as mice and rats can be delivered to your reptiles or amphibians with precision and without dropping them. Crafted from high-quality stainless steel, Exo Terra Tongs are an excellent tool for feeding live insects to reptiles and amphibians. The long, ergonomic pincers make feeding easy and provide enough distance to prevent stress in the feeding animal, while the tips have been "soft-coated" to prevent mouth injury and to provide a firm grip on live feeder insects.